- Before you do anything else, decide what type of event you are going to have, and what its main activities will be. This will be the framework you will build on, and although it can be modified later, it will dictate your site requirements, manpower needs, etc. Be realistic about the resources of your group, and don't plan Crown Tourneys for Cantons with only six regular members unless you enjoy exhaustion. - You should have found your site, roughed out a menu, and done all your budget planning (i.e. set your event fees) at least three months in advance of the event, unless you are having a strictly local event, be-cause that's how far in advance you have to send off a notice to your Kingdom newsletter to appear the month before the event, a very good idea if you expect anyone from outside your group to come. - You will do yourself and your head cook a big favour if you set an absolute cut-off date *and* an absolute cut-off number for your feast. After either that number or that date start a waiting list, and only accept new feasters as replacements for cancellations and no-shows. - Delegate every task in the event. The exceptions are choosing the site and budgeting, which you need control over and anyway should be done before the real work starts. The autocrat's job is to plan and coordinate and you can't do that when you're busy doing everything else. - Get newcomers in your group to work on the event whenever possible. It makes them feel included, it uses their infectious energies and fresh ideas, and it is a good way to train new autocrats. However, give them small tasks at first, and never press a reluctant newcomer. - Never expect anyone to help you unless you ask for their help. Be sure they know exactly what you expect them to accomplish. Then check with them periodically to see how they're doing and if they need help. - If someone really isn't doing or can't do their job, get people to help them or replace them as gently as possible, but don't let one person's problem ruin the group's event. As a corollary to this, never let any one person get overloaded, as sometimes happens when you have a chronic volunteer in your group. - Bring all your sub-autocrats together periodically (monthly at least) to talk about the event. This has the benefit of building a team that knows what the other parts are doing, and also means you can pick their brains for good ideas and creative solutions to problems. - When a major manpower job looms, get a bunch of people together and do it in one or two sociable evenings as far before the event as possible. - If you are someone who isn't home a lot, make your gatekeeper (i.e. troll) someone who is, and publish their phone number in the event notice. They should also be home the Friday night before the event to be called by lost people and last-minute cancellations/reservations. - For small to medium-sized events, say up to about 100, we have found that computerizing the reservation list works very well, since it can be easily changed up until the morning of the event, and then printed off (although don't forget to leave paper for reservations at the door). Some people who work larger events swear by a file card system, which also makes it easier to work several lines at the gate. - As money is spent, collect all receipts and keep them in one place. Make sure everyone knows you need receipts for every purchase. Since some people are reimbursed later and others are spending event funds directly, I use this system to keep things straight: All receipts are initialled by the person who made the purchase, and put in an envelope with the receipts itemized on the outside of it. When the person is been reimbursed, I mark "Paid" on the back of the receipt. - Make sure there are work crews for every labour-intensive task on the day, like serving, set-up and clean-up. If you can't get enough firm commitments before the day, you can set up sheets for volunteers to sign at the door. Don't count on this, though; use it to fill in cracks. - Sleep on your normal schedule the week before the event. There is no reason why you should try sleep deprivation experiments when your event needs you to be alert and capable of solving problems on the day. - Make sure you put one or two hours of mush time in the schedule, to allow for set-up of new activities, and for people to mill around and be sociable. An air-tight schedule is a recipe for a late event. - We have stopped posting an event schedule with times on it. Since people assume events will run late, if we give a firm time they tend to show up late. Instead, we just have the herald in the hall announce new activities 10 minutes before they start. Whether you publish a schedule or not, though, having a duty herald who announces each activity is your best tool for keeping events on time and event-goers informed. - If disaster happens, and your contingency plans don't cover it, do damage control as quickly and quietly as you can, then forget it. People will understand, and if you've done your planning well, it will have a lower impact on the enjoyment level of the event than you might think. - In all things, remember only you and your crew know the mistakes you're making. Everyone else will probably think the event was wonderful. - At the end of the event, politely throw everyone out who isn't helping to clean up (a good line: "We love you all, but *go home*!"). Get out of there as soon as you can, but make sure everything is as you found it before you leave, including the bathrooms and all hallways. If that means oven cleaning until 4 am, it's still better than dealing with the grief a disgruntled site owner can make for the group. - Wait a week for life to return to normal and people to get their receipts in, then begin working on your report(s). 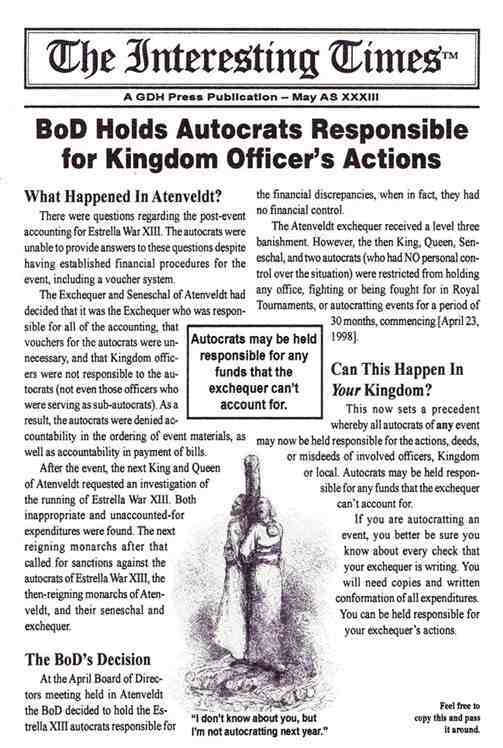 Some Kingdoms require a general autocrat's report, but all require a financial report within a month of the event. If you're no good with numbers, collaborate with your local treasurer. If you have kept good records and complete receipts, the financial report is two hours work, max. The time comes in trying to piece together partial records and find mistakes. 1) Meat pies with cooked filling, *before* baking the crust. 2) Pureed vegetable or fruit mixtures. 4) Roasts -- cook to about 1/2 to 1 hour before done, then freeze, and complete cooking on the day. 6) Meat stews, without vegetables prone to disintegration. 7) Bread, or bread dough, frozen just before the last rising. 1) Rice dessert dishes, like Apple Moyle. 3) Cold meat dishes, or in fact any dish supposed to be served cold. 4) Fruit in syrup or other sauce. 7) Cookies, cakes, and candies. 3) Lentil soup, or other things that tend to burn on reheating. 4) Dishes with vegetables, like greens, that disintegrate easily. We are dead opposed to serving food that's supposed to be hot when it's cold, and our rather anachronistic solution to this is to bring in all the microwave ovens we can get our paws on. (Obviously, this doesn't work for outdoor events, but I serve only the simplest feasts at outdoor events; i.e. lots of roast meat, fresh fruit and vegetables, precooked pastries, a hot soup or stew, cheese, bread.) Any uncooked or partially precooked food gets the conventional oven, any reheated food gets the microwave, to keep it from drying out. It takes a lot of planning to work out the logistics, but we haven't had any complaints about cold food ever. The other trick to mostly pre-frozen feasts is to thaw them out in time. Freeze the foods in *small* batches, and if you can get into the site the night before, setting the frozen food out on the counter overnight is usually enough to thaw it. The only "disaster" we ever had was reheating lentil soup, which though it had been out overnight, was still frozen by 5 pm. In an attempt to get it ready in time, the soup was turned on too high, which of course burned it. In retrospect, lentil soup is easy enough to make that we shouldn't have bothered precooking it. In general, we find that feasts work best if there are no more than two dishes per remove that need to be cooked on site. Any more and, unless we have lots of kitchen help and are super organized, we run the risk of making the feast late and stressing ourselves out. - Get a copy of _Pleyn Delit_, by Hieatt and Butler, University of Toronto Press, 1976. It is still in print, and available in a relatively inexpensive paperback edition. Although it is not a perfect book, every recipe in it is tasty, and documented to the medieval cookbook they got it from. A second good book is the Society publication _How to Cook For- soothly_, Katrine de Baillie du Chat, Raymond's Quiet Press, 1979. This book is not as scholarly, and has a lot of modern recipes, but it's geared to making SCA feasts rather than dinner for six. If you never use any-thing but these two books (or even just Pleyn Delit), you will never run out of ideas for tasty, more than averagely-period feasts. - We plan all our feasts so they are suitable for lacto-ovarian vege- tarians. We have one or two meat dishes in a five or six dish remove, one non-meat protein dish like egg and onion pie or lentils, and we make sure that all non-meat dishes have no meat products in them. When a recipe uses broth but no meat, we use Marmite or vegetable broth, and we know of a store that sells rennetless cheese. Occasionally, we will reserve small meatless portions of dishes with meat in them as a minor component. What this means is that we don't have to plan special vegetarian dishes, and we prefer it this way. It has been suggested to us that it would be a good idea to offer vegetarians a price break, since they won't be eating any of the meat dishes, and we are considering this for future events, since it's also a good way to get them to identify themselves. - Feasts must have balance. Each remove should have a solid meat dish, a non-meat protein dish, a starchy dish, a vegetable or fruit dish. Follow a bland dish with a strongly flavoured (sweet, sour, spicy) dish, and vise versa. Keep textures in mind too, and keep mushy or soupy dishes away from each other. You should also consider serving dishes and cooking needs when planning the order of serving. For example, plan two dishes that need reheating at far ends of the remove. - I dislike the tendency I have seen in some places to have the first remove consist of bread, butter, cheese, raw veggies and soup. It leaves this feaster feeling cheated, since if there are only two removes, half the feast was nothing but munchies. If you want to put these things on the table *then* serve the first remove, fine. Personally, I prefer to just leave out the raw veggies and raw cheese. - Pretest all the recipes you want to use. Invite your friends. This will let you in on any tricky techniques that might otherwise catch you by surprise, as well as letting you decide whether or not the recipes taste good. - After you have pretested, figure out the cost of buying all the ingredients. Don't leave out anything, and be as pessimistic as possi-ble. If the final cost is too big, figure out ways to economize on dishes (cutting the amount of wine in half is my favourite way), substitute less expensive dishes, or cut dishes. Under no circumstances should you plan to go overbudget on the feast. - Check out the kitchen facilities at the site before you finalize your menu. Oven and fridge space may rule out some menus. - When you precook, get work teams to help you out. There is no reason why you should do it all yourself, and it's more fun with help. Before you precook anything, though, make sure you've got freezer space to store it, or you could be in for a nasty surprise. - Another way to get help is to assign the production of one dish to an individual. This, however, brings in the problem of how to pay for the ingredients. My first group preferred to have the cook who was making the dish buy their own ingredients and submit receipts for reimbursement. My current group prefers to have the head cook buy all the ingredients and then distribute them. This last has the advantage of giving the head cook control over the amount of money spent, but distribution can be a hassle. - You should not have to spend money out of pocket for feast food. When it's time to buy food for the event, if we haven't already received enough reservations to cover it, we make a concerted effort to collect feast fees from our local group, which usually gives enough to start with. - Get your normal amount of sleep the week before the event. You'll need to be alert on the day. Also, remember to eat lunch, or your blood sugar will crash just about the time you're into the final push to get the feast ready for the table. - If you can at all possibly get into the hall the night before, do it. Any dish intended to be served cold can be made at this time, without having to be carted in, and precooked food can be brought in. But beware of cold storage space; most sites don't have enough fridge space to store the average feast, and leaving meat or dairy products out overnight is a recipe for food poisoning. If it is cool enough, the outdoors can be used as a refrigerator in a pinch, but otherwise keep meat at home overnight. - One trick for organizing the kitchen I learned from Lady Lyanna of Kerneough, Baroness Ruantallan, is to post one sheet of paper per dish above a space on the counter where that dish will eventually end up. On the paper, list the dish, the order in the feast it appears, the prepara-tion it requires, and the serving utensils required. Stack the dish and its utensils under the sheet when they are ready. That way, the head cook and kitchen staff can see at a glance what needs to be done when things get busy later. - Keep everyone out of the kitchen except your help and the serving autocrat, especially just before and during the feast. The last thing you need is to be tripping over well-meaning-but-superfluous people. - You should have a separate serving autocrat (whose job is not to serve, but to direct the servers), and you shouldn't be doing any actual cooking while the feast is being served. Getting the feast out in a timely manner depends on the communication between you and the hall. - Have the hall herald announce the dishes, either at the beginning or as they come out. People like to know what they're eating. - A good pacing is to have most people just finished the last dish they were served as the next one arrives. Any faster and they will get swamped, any slower and they will get bored and wander off. This makes about 1/2 hour to serve a 5 to 6 dish remove. Allowing about a half hour between removes is about right, unless you have a lot of entertainment planned, in which case you should still allow about 15 or 20 minutes after the entertainment for people to get potty breaks, etc. - Although I realize that this is sometimes impossible, I prefer to arrange for servers and give them a price break (sometimes free feast, sometimes 1/2 price feast), instead of the convention of having one person from each table come get the food. Regardless, head table should always have each person at it served individually. Plunking food down in the middle of the long head table means the people at the ends starve. - If you have full-time servers, save some of every dish for them, or feed them in advance, otherwise they will not get any meat but have two quarts of barley and some cabbage to eat instead. - Send around bowls before beginning the next remove for people to put their scraps in. - Providing the feasters with tubs of water (don't forget dish cloths and towels) to wash feast gear in saves the bathroom sinks at the event. Please don't assume that people won't use the bathroom. Having someone watch the tubs and change the water when it gets too disgusting is a great courtesy. If you can't have washup facilities, at the very least provide a garbage can for people to scrape their platters into, and plastic bags. - "Clean up as you go!" should be your rallying cry, and you should have at least one person doing dishes at all times you are producing them, but especially during the feast, when you will need to recycle serving dishes. Piles of dirty dishes never touched during the day are what leads to the 4 am cleanup duty. And clean dishes well, using a bleach rinse. - If at all possible, the people doing the cleanup should not be the same ones who cooked all day. A fresh crew will do the work much faster, and if they are willing to work through Court or dancing, we have found that we can have the kitchen cleaned up before the event is over. - Never pour soups or other soft foods down the sink or toilet. (I hope this sounds like an idiot instruction, because one visiting long-time member who really should have known better poured soup and Apecian Carrots down the toilet at our last event, and backed it up.) If you must do something, strain out the liquid and pour it down the toilet, then throw the solid food in the garbage. Better yet, take it home. - In fact, the best way to dispose of leftovers at the event is to contact your local Salvation Army soup kitchen, or the like, in *advance* of the event, and ask if they would like them. Food banks can also be contacted, but they won't usually take pots of food or cooked roasts. If anyone has made it this far and feels hungry for more, I suggest they find the article in the Known World Handbook, "A Beginner's Feast Manual", by Dame Enid Aurelia (who just happens to be my Baroness) and Dame T'Sivia bas Tamara. They have a different perspective but similar philosophy. P.S. Permission is happily given to reprint any or all of these tips, if anyone thinks they would be of use. I would appreciate credit, and it would be nice if you dropped me a note to let me know. A) The autocrat was so rushed doing last-minute things that there are big gaps in the financial records for the event. What the local treasurer ends up facing is a pile of money, a much smaller pile of receipts, whatever records were kept of how many people paid for the event, and a red-faced autocrat trying to explain how all these pieces fit together, and failing. Problems in the treasurer's records affect a group's tax status, and in extreme cases can threaten its continued existence as an official SCA branch. So the treasurer and the autocrat must somehow re-create the missing records, however much time and effort this takes, and they may have to do a lot of guessing, which is very anxiety-provoking. Local groups don't need burnt-out treasurers! 3) a bardic competition held in a hall where the acoustics won't even let you hear what your friend across the table from you is saying. 1) the group ends up owing major money to a site for damages, perhaps even more than the group has in its treasury. Add to this the high likelihood that they lose the site, and perhaps even damage their reputation in the mundane community and find that some other sites are no longer open to them. 2) the site's kitchen was not designed for what the group has done, and as a result the sink (note the singular) backed up, the fridge was left less than clean and its shelves were damaged, there are knife scars on the countertop, all the dish soap and dishcloths belonging to the site have vanished, the coffeemaker was used to hold the used oil from the deep fryer, and the oven is a total disaster area. Possible results: the group owes money to the site for a plumber's visit, various repairs, a new countertop, kitchen supplies, and the people the site had to pay to clean up. The group loses the site, or kitchen privileges at the site. The cooks are demoralized and there is much bad feeling within the group. 3) there are a lot of unhappy performers who feel that people at the event were deliberately rude to them (when in fact they just couldn't hear so they didn't pay much attention); the bards are demoralized and there is much bad feeling not only within the local group but possibly on the part of performers from other groups who attended the event specifically in order to perform. What's going to happen the next time someone tries to arrange for entertainment at an event? C) The autocrat failed to arrange for a herald, a chirurgeon, a marshal or a cleanup crew. People who came to the event to enjoy themselves--many of them from other groups--end up spending their day running things instead of participating in them. Or, worse yet, it turns out that there IS no chirurgeon present at, say, a fighting event. Or no marshall, so no tourney can happen. Some of the attendees from out of town are more experienced SCAdians than the people running the event, and they end up taking responsibilities, and staying till well after midnight making sure the site is clean enough that the local group won't lose site privileges. Then they drive 3 hours to get home, since they didn't know they would stay so late, and anyway it seems the autocrat was kind of careless about providing crash space for the people who did indicate in advance that they would need it . . . Are these people going to come to the group's next event? Will they come back within a year? Three years? Who knows??? But chances are, they'll have a *goooood* story to tell other people in other groups . . .
Like Sarra, I've autocratted a number of events, both as overall autocrat and as head cook, and also been subautocrat for really large events where you need an actual autocratting TEAM. I didn't start autocratting until I had a very good idea of what needed to be done differently from the way I usually saw it done. As a result, I remember a lot of people expressing their surprise that a "green" autocrat did such a good event. The "secret" was, I wasn't really green--I'd learned from other people's mistakes, instead of by making them myself, and I thought that this business of glorifying the "last- minute disaster" style was totally for the birds, so I substituted careful advance planning for eleventh-hour crisis management. None of this is to criticize any particular individual(s). I'm criticizing a mindset, almost a subculture-within-a-subculture. In fact, I owe a great deal to individuals whose work I observed. Not only did I learn from their mistakes, but some of their ideas were really creative solutions to unforeseen (by them) difficulties, and these were helpful to me later on. Even the best advance planning can't foresee everything that might go wrong. Some examples of REAL last-minute crises are: the site's oven breaks down a few days before the event and the cooks have no way of knowing this; the site loses the check the treasurer gave them, and the autocrat discovers this on the morning of the event when it turns out there's a wedding party at the church; the picnic event turns out to be on the hottest day in 100 years (yes, it happened! ); it snows on the camping event in September (that, too.) These are NOT the kind of preventable disaster that is the focus of my remarks. The best you can do for these is good contingency planning, and maybe prayer. One point where I do disagree to some extent with Sarra's remarks is .... "Late feasts and burnt-out autocrats are things that can be prevented with a very small amount of advance planning..."
It's been my experience that it's usually more than a "small" amount of planning, but it's always less than the major grief that goes into management-by-crisis. You can also undertake more ambitous projects than you can with the old "disaster mode" style, and pull them off so well that many people won't even realize WHY they had such a good time at your event. That is to me the very best success, as it is unobtrusive enough to support, not distract people from, the goals of the event itself. Those goals can range from just having a good time, to the display of pageantry and other "atmospheric" things, to educating people in a fun way about some historical theme, etc. etc. I don't think that it's proper for the focus of an event-- and perhaps the main impression that people carry away from an event--to be on how well (or badly) the autocrat(s) managed crisis after crisis. I have taken the time to comment on this topic not only because it interests me and I enjoy running on about it at length ;-), but also because I have a commitment to teach the skills for which I have been recognized in the Society. "Autocrat" is one of those. Most of what I've discussed here has been expressed as criticism, but I do have more positive suggestions, both for individual autocrats and for the kind of administrative structure a local group can provide to help those who run events, and insure better events for the group. I can probably dig up an on-line article or three for interested persons. Also, there are some good autocrat's handbooks out there, including one published in Carolingia.